In a story as short as it is inspired, Borges recounts the map of an empire which had the exact size of the empire, map and territory coinciding, point by point, in an unexpected one-to-one scale. A few generations passed until this cartographic delirium was found to be useless, and it ended up abandoned in the deserts, under the merciless sun and winter weathers. This story somehow accounts for not only the failure of this clueless, gigantic map, but of any system of representation, generally – they are almost always lacking, unfortunately, destined to the imperfection, and more often than not, completely useless. This, I believe, is one of the conceptual vectors in this Essay on an order of things, by Marina Camargo. Marina knows about the imprecision and shortcomings of our representations – whether artistic or scientific, geographic or historic, anchored in texts or images, or even both. Try it out yourself: pick up two maps corresponding precisely to the same borders and following the exact same scale. Now overlap the two. They will never coincide. You could also ask yourself: how can we transpose the relief of the Earth to the circularity of the globe in a faithful, reconcilable manner? How can we combine the curvature of the globe with the flatness of the map? Instead of lamenting these misfortunes, the artist delights in them, savors them. Both the rigor and the failure of representations are accepted and welcome. It is also true that, in this new series, the first perception is combined with a penchant for maps as objects, as coordinated dispositions or collection items, paperwork that is folded and unfolded, with its particular codes, grids, and consensual language. All of this is available as material for drawing. All it needs is a rearrangement. The maps finally emerge as graphic testimonials – of inescapable political bias – on previously defined and traveled territories, or lands to be conquered, recognized, desired. 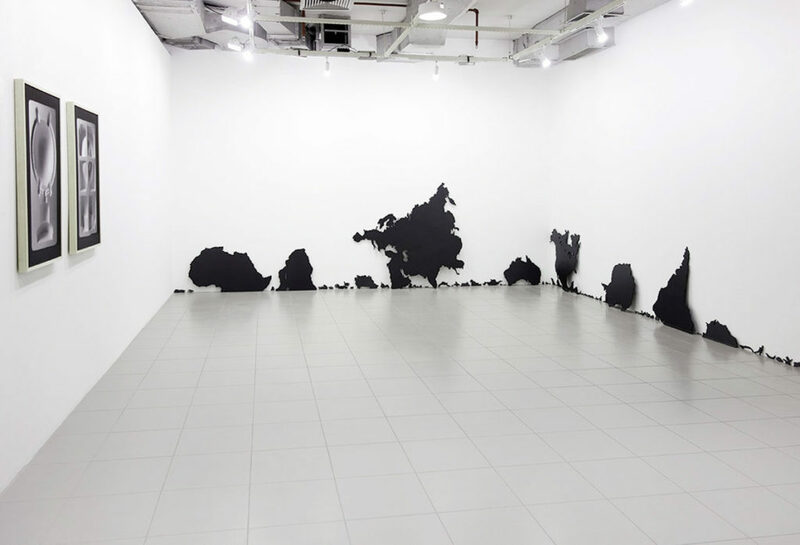 Marina cuts the maps, reassembles their geographies, points at the empty spaces that, however inadvertently, may reveal a presence. The maps, as Borges would have wanted, survive as ruins. Text written at the occasion of Marina Camargo’s individual exhibition “Essay on an order of things”, at Goethe-Institut Porto Alegre, 2015.